Here are the business cards I put together for Alt - I made a couple different versions. 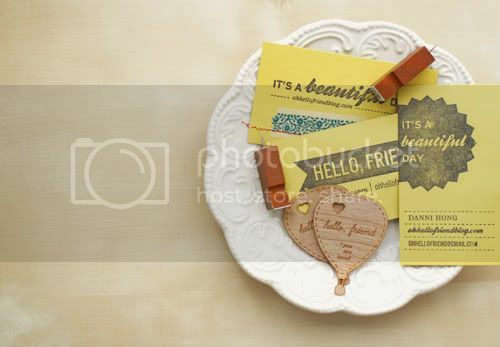 All I used were some glassine envelopes and blank business cards, some cute wood push pins, avery labels, japanese tape, custom wood hot air balloons (made from the same place I used for my wedding invitations), and I got some custom rubber stamps made. 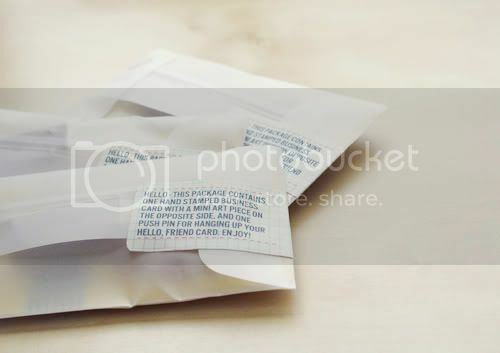 just designed a wrap around label to seal the glassine envelopes. Okay, I got carried away with the stamp designs and made 3. Well, I had 1 from before so I really only made 2 new designs. Hurray, that's all! What do you think? I was only able to make a certain amount of these, the push pins are no longer sold at the store I got them at so I guess these cards are now limited edition. I'll have to come up with something new for next year. I really love business cards, what about you? those are soo perfect! i love all the little details! i think i need to work on a new design for mine now. I so love the glassine envelopes and a little treasure to pass along. I need to rethink mine now. Thanks for the inspiration! I love your hot air balloons! So unique, creative, and just overall amazing! These designs look lovely! I wish I could have funky business cards but it's just official stuff (although I was told our school's new logo won tons of design awards... but I just don't see it). You make always such nice things! 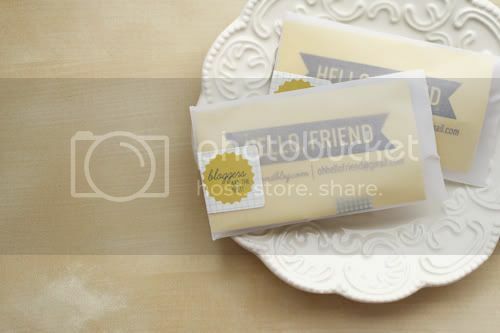 Love this idea Danni, I just ordered myself a custom business card stamp last night! i saw you are vending at LACE this weekend, I'll be there too! Would you mind sharing where you got the custom stamps? very cute! its nice to see such a personal touch on some thing like a business card! danni, i love how the business cards turned out! so cute, especially the "mini art" :) great job. and the blog layout updates look great! I love handmade business cards, they really are a great promotional material - especially for people who are in the handmade business. I've seen your card in several design blogs already, and right when I saw it in pictures I recognized it as yours, didn't even had to read the credit lines. All I can say is WOW - I am in love with your business cards. Such a great idea to include a push pin to hang your card. Absolutely brilliant idea! YOU ROCK!!! I would love to know where you got the custom stamps made, if you don't mind sharing! 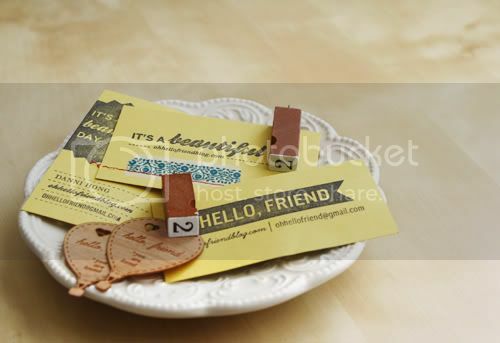 These are great; I love your creative approach to business cards! 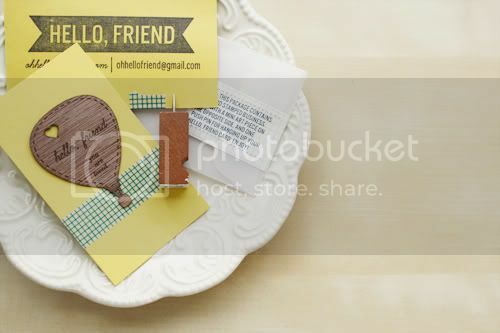 there's just something about handmade business cards that are just so great! i made my own myself as well (lots of saved$)... and YOURS is sooooooo great! love all the elements you used with it! Collecting business cards is kind of a sickness for me. I love them all! Love the yellow color and the hot air balloon takeaway of yours. Very smart. Oh my gosh - these are gorgeous. And that little wooden hot air balloon is genius! These are fabulous! Would you mind sharing what company you used for your custom stamps and the little hot air balloons? Your cards are so awesome! Very creative! Wow - that's a lot of time and effort but boy, it looks like it was worth it. I bet these made a great impression. they were simply BRILLIANT danni. hands down, my favorite card from the conference (out of like...100!) great job. your ingenuity never ceases to amaze me. so sweet and so you! Those are really cute. I've ordered some minicards at Moo but eventually I'd like to create my own business cards like yours. Inspiring! I love them! It's so impressive that you made them all without using a printer. That's thinking outside the box, for sure. These are the best cards I've seen in a while, and I actually design them for a living from time to time. Way to go, lady! Love your business card packet! Too bad the push pins aren't available anymore. I would love you to check out the tacks I made out of branch clippings. Super easy to make. these are fantastic! I love that you included a push pin! amazing business cards! you have such a talent for creating pretty things. killer cards danni! you inspire!!! really really loving those stamps...man i need business cards! thoes push pins are wonderful. thanks for all your creative & inspirational work. Love the creativity on these. We have used Bullfrog before for some projects/gifts and he has been GREAT to work with. Are the balloons just a wood veneer that he laser cut? Wow, those are so sweet! I love all of the detail you put into them. Love them! I am completely obsessed with stamps right now and these are great! They reflect your personality and creativity perfectly. girl! when are you going to have stamps in your shop! i can't wait!!! ahhh i love your cards girl!! soo cute and unique!! Danni, these are quintessentially you! The stamped detail, pins, and envelope are such lovely touches! Brilliant idea. I love the look and wording on these cards. So cute and fun!!! Danni - you never fail to inspire me. man... these are so cute! i would love to get one!! unfortunately, i live sooo far away from where you are. These are utterly adorable! I have a weird obsession with collecting business cards so I would love to get one of these. You are so creative Danni! These are amazing!! Thank you for posting your source for the wood tags. I contacted Rob for a project (and am in Portland, too! Love them! These are awesome, Danni! Danni! !they're so cute and creative! !i love them!! The push pin is a great touch! danni!!!!! you are a design genius -- i LOVE THESE! Awesome business cards! Definitely makes a great first impression on people. You've really gone the extra mile to make these extra special. OH MY GOODNESS!! These are fantastic! Everything about them. Love it love it love it. Now I wanna make some! seriously I just died seeing those beautiful little packages you gave out at Alt. I am in love with the hot air balloons! Did you make these or did you order them from someone? these are beyond fabulous and super distinctive! i LOVE the yellow color, the sewn details, and the wooden hot air balloon is so unexpectedly awesome. great work, as always! I just adore what you've made! I'm starting to think about my cards to bring to the Renegade Craft Fair in London this fall, and your cards in particular have really inspired a lot of ideas for me. This is so fun! These are brilliant! Love the hot air balloon! These are wonderful and a very inspirational idea! I've been thinking of getting some business cards and now I'm totally rethinking my initial ideas. Lovely business cards. I’m inspired to make some hand stamped cards for myself! Great blog also. Miss Danni you are so crafty + creative! Business Card is like a key to open the gateway for your business. Hi Danni! Love these! Would you mind sharing where you found the customized stamps? I've been searching for a source that can do excellent work on a custom logo stamp for my business with no such luck. Thanks! These are some really cool business cards. I like how you provided a method for people to put the cards someplace instead of just laying around. 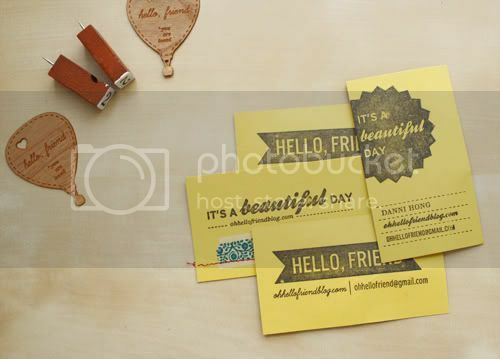 Great post..it's really stunning work regarding plastic business cards...keep it up!!!!!!!! !